Caraway seeds are highly aromatic and have a distinctive mild anise flavor that adds a welcome and subtle licorice hint to many dishes. Their taste is earthy, with a hint of citrus and pepper. A frequent addition to spice cabinets, caraway seeds are actually the dried fruit of the caraway plant. Nevertheless, they're commonly referred to as seeds in the culinary world. If you've ever eaten rye bread, you no doubt tasted caraway seeds. Caraway seeds are similar in flavor to aniseed—not star anise—and you can substitute anise seeds for caraway seeds in a recipe. Add caraway seeds to potato salad or coleslaw. Add a pinch to any tomato-based sauce or soup. Sprinkle over roasted potatoes or sweet potatoes. Sprinkle onto baked apples to enhance the flavor. Add to shortbread cookies or Irish soda bread cookies. Use to flavor beef goulash or kielbasa stew. Add to any recipe that includes cabbage. Use with a pork roast or pork chops. 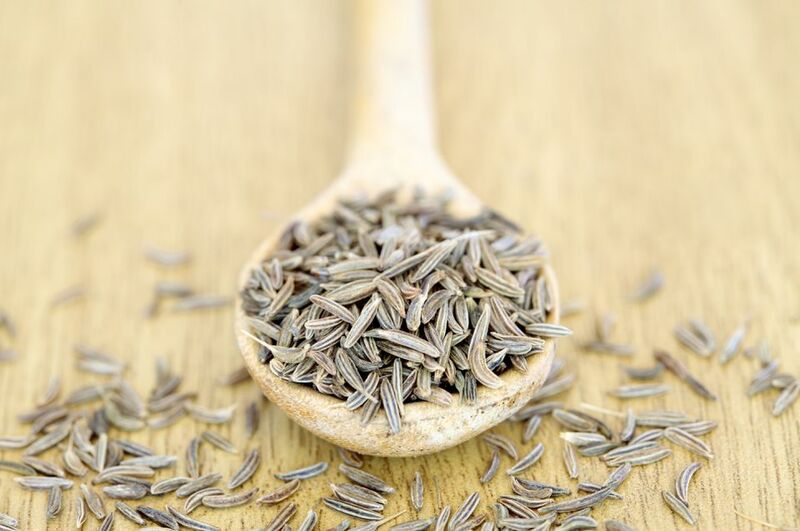 Caraway and cumin both belong to the parsley family and they are similar in taste. You can substitute ground caraway seeds in recipes that call for ground cumin, although the flavor will not be as strong or hot. Caraway seeds are also an acceptable substitute for coriander seeds in recipes. When you make a spice substitution, start out using half the recommended amount and taste as you go. You'll probably be able to add the entire amount, especially if you are substituting with a spice that has languished in the spice cabinet for a while and lost some potency. However, you may need to make adjustments to other spices in the recipe you are following. Toasted caraway seeds are a flavorful addition to loaves of bread and salads, but the earthy fennel and anise taste is mild until the seed is cooked or dry roasted. To toast caraway seeds, place a small dry skillet over medium-high heat and add the seeds. Cook for 2 to 3 minutes, or until the seeds are fragrant. Remove from heat and let the seeds cool. Then, add them to your favorite baked goods. The caraway plant is a member of the carrot family. The leaves of the caraway plant can be used like any leafy herb, much like its relative parsley. In addition, the root of the caraway plant can be cooked and eaten as a root vegetable.